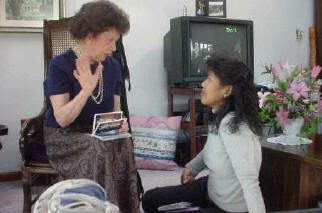 Elvie listens as retired missionary Bea shares "stories from the field." While visiting my brother Phil, a pastor in Western Pennsylvania, he invited us to speak at his little girl�s second grade public school class. This was one of many such opportunities to share about Philippine culture in schools and civic clubs. At each place Elvie asked if any children had questions. Of course dozens of little chubby hands always reached for the ceiling every time she came to this part of the presentation. �Do you really eat chicken feet, bones and intestines there?� Yes, but we eat the parts you eat as well. As a river must find its way to the sea, a dream must find its time to be. In our last prayer letter we mentioned the exciting news: funds had just been pledged for the purchase of land adjacent to our Philippine BLC elementary school on which to build a much-needed dorm. The miracle continues: God is touching hearts! As our little red car keeps bringing us further east in the USA, the Holy Spirit accompanies us. We watched Him work in lives again in W. Virginia. Saturday was balmy and sunny, but Sunday morning I woke Elvie up with the news: �It�s all white outside!� Half a foot of snow, winter�s last vestiges, blanketed everything. Nearby churches were closed. 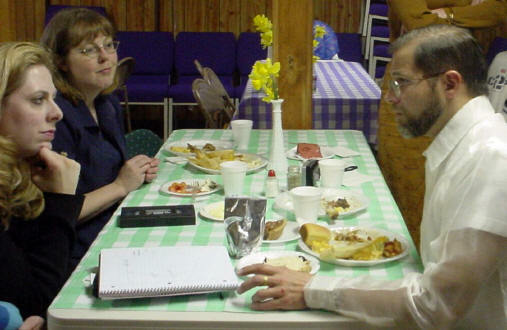 The pastor started getting phone calls, asking if there was going to be a service. A week later, in a different state, I was sent an email from W. Virginia: �Paul, the congregation is excited about our 2 upcoming missions trips to Davao in Nov. & Feb! Our VBS committee also made the unanimous decision to give their offerings this year for your dorm project! Praise God, He still is touching hearts! Paul shares with a nurse in West Virginia how she can help in the Philippines. You love to take pictures of large groups of people, or people eating at full tables of food.